Identifying and trading the wedge chart pattern helps spot trend reversals, price target and new support or resistance areas. To begin with, let's take a look at the Falling Wedge. This chart pattern has a similar look to it as the symmetrical triangle, in that it has two lines converging towards the apex. The major difference however, is that when it comes to wedges, both lines either rise or fall, whereas with the symmetical triangle, one trend line is rising while the other is falling. As you will observe from the chart to the left, both support and resistance lines are falling. In addition, they are converging toward each other. You will also notice that as the stock moves further into the wedge, the range of movement between support and resistance is constantly reduced. As the constriction takes hold, it no longer becomes profitable for directional traders to enter directional positions within this pattern. As wedge chart patterns typically form, you will also start to see that the daily trading volume for the stock will begin to fall. Before this happens however, you will probably have initially identified the pattern as a channel. We all know that a good channel can be traded both upwards and downwards but if you do not notice the peaks and troughs are coming together, the temptation to trade this pattern as a channel will remain. When we have a falling wedge chart pattern, the falls of the share price when bouncing of the upper trend line will offer better option trading opportunities for a while, but the rises will become un-tradable much quicker because the overall momentum of the price action is downwards. Looking at the image above, you'll notice the trading area indicated by red dots will typically have better volume and consequently, trading will be more profitable. Trading in the opposite direction, indicated by the green dots, will usually have a reduced level of volume. This is primarily due to the well known fact that a falling share price will have less volume on the pull backs and more on the runs. The only time you are likely to notice an increase in volume for the upward price action, is when a breakout is in preparation. Falling wedge patterns have a habit of breaking out in an upwards direction and increased volume on the up-swings is our warning signal. It has been put this way: "A wedge has a habit of breaking out towards the steeper side". When examining this statement it is apparent that the steeper side for a falling wedge chart pattern is the upper side, or resistance line. In our first image above, the price action did exactly that - it broke out to the upside. When a valid breakout occurs you will see an increase in volume and this provides reassurance that it stands a chance of continuing in the short term. 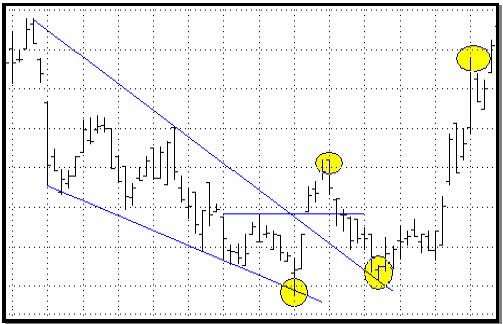 This brings us to the behaviour of the wedge pattern when it does decide to break out. 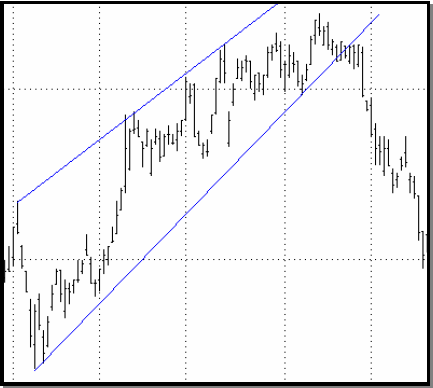 A wedge does have the tendency of re-testing the line it has just breached prior to going for a run. Please remember that "tendency" does not mean "every time". So if you only try to trade wedges after the retest, you will miss some moves. Nevertheless, this is a more conservative trading style. It is true that some money will be left on the table but entering after the re-test puts the odds in your favour over simply entering on the breach. 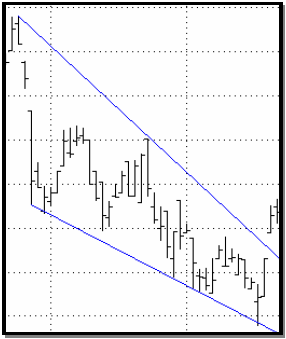 Another point worth noting is that the wedge chart pattern will usually reverse the direction of the trend. With a falling wedge, the trend has changed once the price action has breached and climbed above the level of the last peak. If you're trading the re-test, make sure that this trough is also higher than the final trough before the breach, so that you now have a higher low and a higher high. This is your first sign of the new trend and is illustrated in the image below. 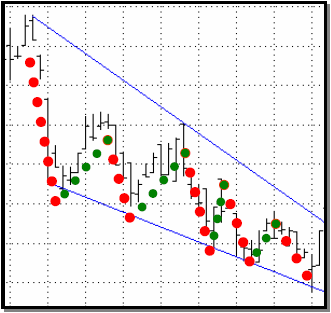 Is it possible to calculate a price target once a breakout from the wedge has occurred? Yes, it is possible and it is as simple as calculating the distance between the first opposite touch within the wedge and the opposite trend line. Once calculated, you simply place it on the breakout point, as illustrated in the image below. Looking at the illustration, we can see that the breakout almost made the target. Another thing to note, is that this target can become another point of resistance and force the price action back down if the move was too weak. In our illustrations above this is exactly what happened until the stock managed to gain enough strength, following the re-test, to break up through the resistance level. It needs to be understood that measuring the potential price target is just that - the "potential" and is not absolute. 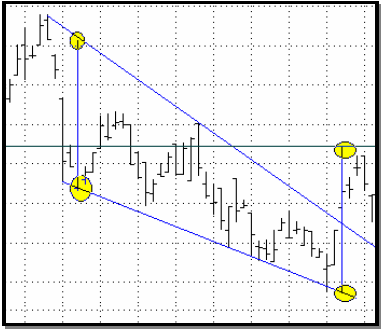 There a many similarities between the rising wedge and the falling wedge chart patterns. Both patterns have resistance and support lines which converge towards the apex. As with the falling wedge, it is just as possible to calculate the potential price target following a breakout - and like any wedge, it may re-test the breached line prior to continuing the reversal. In our sample chart above, we can see that the price action broke out across the steeper line. With this knowledge, we can closely follow a stock once it has move into a wedge pattern and is being squeezed together. We just wait for the breach and jump on board for the winning side. An important point for options traders to remember - the potential price target is exactly that, so don't be tempted to buy out-of-the-money option contracts (and more of them for the cheaper price) simply because the price target is around that level. This form of trading could take you out very quickly should the stock turn and not reach the target.